Rock The Body Electric: Dylan Cover #359 Eddie Cano & Nino Tempo "Don't Think Twice, It's Alright"
Dylan Cover #359 Eddie Cano & Nino Tempo "Don't Think Twice, It's Alright"
In this ongoing Monday Series we will be exploring various artists versions of Bob Dylan song's. Today's tune comes from Eddie Cano & Nino Tempo covering "Don't Think Twice, It's Alright"
This song is so iconic and flat out awesome, even people who dislike Dylan have to enjoy this tune right? Biting and yet not bitter, a toss off of the grandest proportions, "Don' Think Twice, It's All Right" is epic and yet so straight forwardly simple. It easily ranks as one of the bard's best works, truly a classic and has been covered by so many people in so many ways. 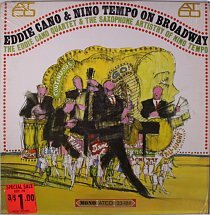 RtBE is unfamiliar with Eddie Cano & Nino Tempo, but in researching they are a piano player and saxophonist respectively. A perfect jazz interpretation of a Dylan tune. When we brought this series into Jazzy January this is exactly what we were hoping to find. A cool tune, will need to do more research on these artists.